Indian Army Muzaffarpur (Bihar) Rally 2018 Admit Card Check Here. Indian Army Notification is out. Indian Army is recruiting for 100+(Not Specified) Muzaffarpur (Bihar) Recruitment Rally 2018 Posts. You can check Indian Army - Indian Army last date, download Indian Army notification, visit Indian Army official website and check other Indian Army Vacancy details.Complete Vacancy and recruitment Details about 100+(Not Specified) Muzaffarpur (Bihar) Recruitment Rally 2018 vacancies in Indian Army are provided below by JobSarkari.Com only for you. Soldier General Duty Candidate Must Have Passed Class 10th With 45% Marks. Candidate Must Have Passed Class 12th in Science With Physics, Chemistry, Maths and English With 50% Marks. Soldier Technical (Aviation / Ammunition Examiner) Candidate Must Have Passed Class 12th in Science With Physics, Chemistry, Maths and English With 50% Marks. Soldier Nursing Assistant / Nursing Assistant Vetennary Candidate Must Have Passed Class 12th in Science With Physics, Chemistry, Maths and English with 50% Marks. Soldier Clerk / Store Keeper Technical / Inventory Management Candidate Must Have Passed Class 12th With 60% Marks. in Any Stream. Soldier Tradesman Candidate Must Have Passed Class 10th With ITI in Related Trade. 6.Online Application Can be Submitted on or Before 22nd December 2018. Q. What is the Last Date For Indian Army Muzaffarpur (Bihar) Recruitment Rally 2018 Vacancy ? A. Last Date for Indian Army Muzaffarpur (Bihar) Recruitment Rally 2018 Posts is 22/12/2018. Q. 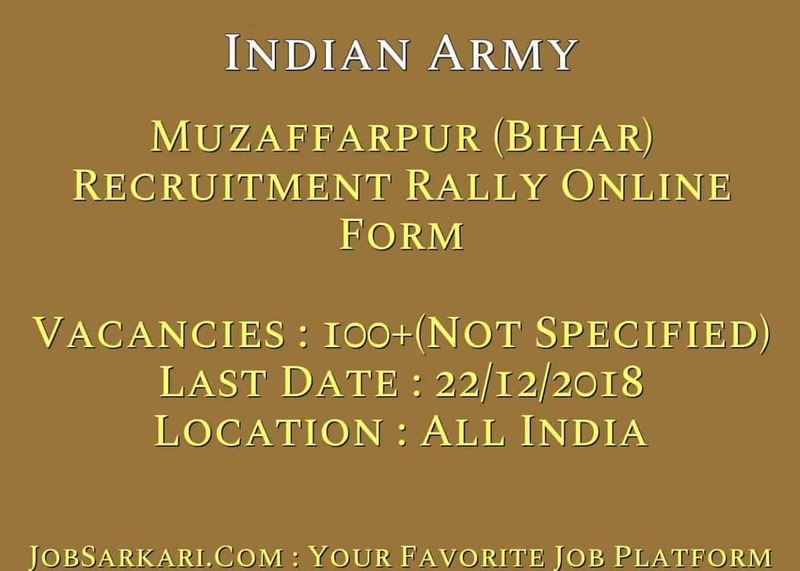 What is the Form Type of Indian Army Muzaffarpur (Bihar) Recruitment Rally 2018 Recruitment ? A. The Form Type for Indian Army Muzaffarpur (Bihar) Recruitment Rally 2018 Posts is Online. Q. 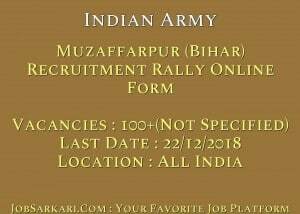 How many vacancies are available in Indian Army Muzaffarpur (Bihar) Recruitment Rally 2018 Posts ? A. There are about 0 Vacancies in Indian Army Muzaffarpur (Bihar) Recruitment Rally 2018 Posts. Is is Link Se Sari Sarkari Naukri k liye Apply kr Sakte Hain. Nhi Aap Apply nhi kr Sakte Hai.. Disctrict ke Naam Diye hue Notification me. aap Check Kr Sakte Hain.